Default Folder X 4.3.7 is available! Version 4.3.7 of Default Folder X is now available. It brings Drag and Drop support to the preference pane for adding favorite and default folders, adds nice little shortcuts to make working with your preferences easier, includes two new AppleScript commands and fixes a number of bugs and compatibility problems. Things run more smoothly in general, so I recommend this update for everyone. In particular, make sure to download this version if you use Microsoft Word, FileMaker Pro, PyMOL (yeah, I’d never heard of it either), or if you’ve had instances in which Default Folder X’s toolbar buttons stop responding. More information and download links are available on the Default Folder X What’s New page. 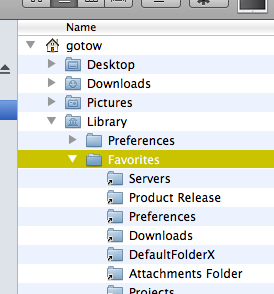 Default Folder X lets you mark folders as favorites so you can get to them quickly. Unfortunately, it displays those folders in its menus using their names – if you’ve got two identically named folders named “Images,” for instance, they both show up in Default Folder X’s menus as “Images” and it’s hard to tell them apart. 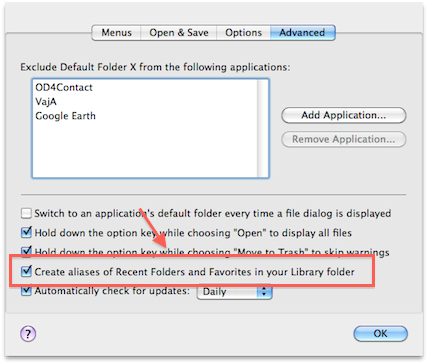 Open Default Folder X in System Preferences. Click on the Advanced tab and turn on “Create aliases for Recent Folders and Favorites in your Library folder”. In the Finder, navigate to this folder: HOME/Library/Favorites. Locate the aliases of the folders you want to rename. Rename the alias files using the Finder. Default Folder X will then read those names and substitute them for the original folder names in its menus.